Although it appears that NASA's space shuttle program will fly at least one last mission in 2011 -- the process began this week to reschedule STS-134, the final planned shuttle flight, to February -- the agency is continuing with its plans to mark the retirement of the orbiter fleet this year. 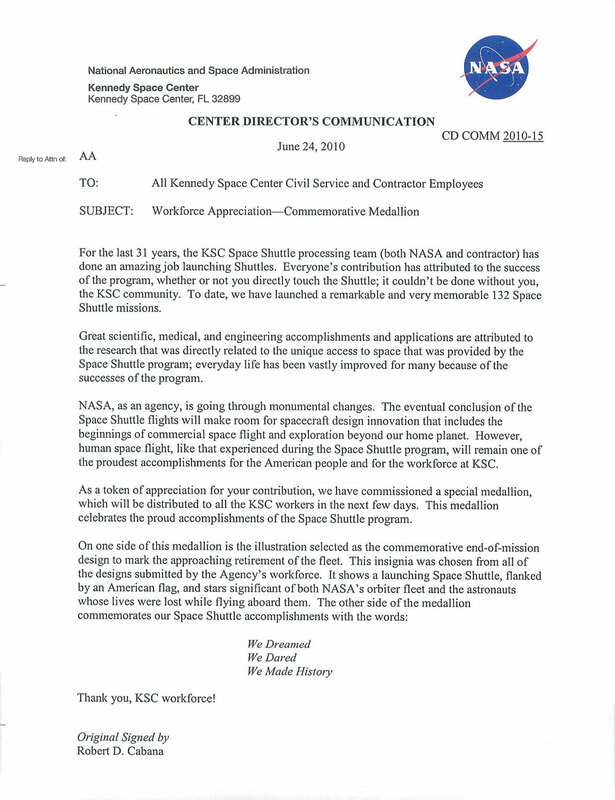 On Thursday, Bob Cabana, director of Kennedy Space Center, issued a memo to the spaceport's workforce that over the next few days, all workers will be receive a "special medallion" as a "token of appreciation" for their contributions to the shuttle program. 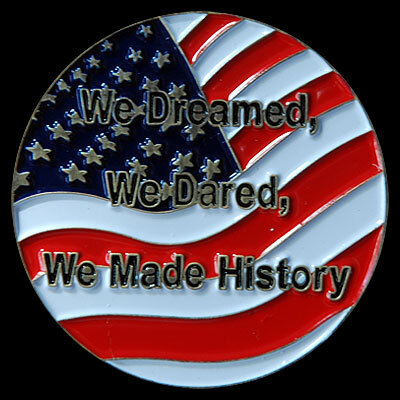 The high-relief medallion features the program's official commemorative design as chosen earlier this year on one side and on the reverse, the words: "We Dreamed, We Dared, We Made History" over the stars and stripes. Nice medallion, but it looks like the last shuttle mission will fly in 2011, so the reference to 2010 as the end of the shuttle program on the coin is incorrect. It would have been better if NASA had waited until a final decision was made regarding when the last shuttle flight would occur before having the medallions made. I want to add that the shuttle on the medallion does not look right. The wings dimensions are wrong and the nose/cockpit area looks to narrow. The emblems on the wings are way too big. Don't like it at all! I was only going to point out what may become a historically incorrect date, but now that you mention it... what's with the 'sliced' external tank? Picked up one at the gift shop last launch. $5.00. Indeed, these were available at the NASA employee exchange stores around the time of the STS-132 launch. ...what's with the 'sliced' external tank? Yes Randy, good observation. Also I just notice that the payload area is really narrow compared to the wings dimensions. What company produced the medallions? Seriously, although the design of the shuttle should/could be better (especially for a NASA-sponsored item), I think that the fact that the date of the last flight being incorrect (which it probably will be) is a significant mistake. How would it look if the NASA Spaceflight Awareness coin for Apollo 11 referenced 1970 as the date of the landing? Or if the dates on any of the NASA-sponsored SFA coins had an incorrect mission date and/or year? The unfortunate truth is that by the time the last orbiter leaves the pad, many of the Kennedy Space Center workers who have worked on the shuttle will have already left the program. I can't say for certain, but I suspect there may have been a desire on the behalf of management to distribute these to as many as possible while the opportunity still existed. The official art as approved for use by NASA earlier this year included the 2010 date because there was confidence at that time that they could fly out the remaining missions this year. Unexpected delays preparing payloads resulted in the present slip into 2011. I think given the choice between showing some form of appreciation to as many workers as possible versus waiting for the unexpected to happen, the earlier was a better choice. I disagree with you Robert. I'm sure that there was a desire to give the coin to as many members of the shuttle program as possible before they left, but frankly issuing a coin commemorating events with specific historical dates that have the wrong dates was not a good decision. With the last launch scheduled for November NASA could have waited a few more months. The agency knew that if the program was going to be extended the decision would have to be made soon, before too many people left. And, to put it bluntly, if some people left before the coin was available, well, that's too bad. Although the intent to give the coin for free to the workers is admirable, if individuals who left the shuttle program before the coin was available really wanted one the coins are only $5.00. 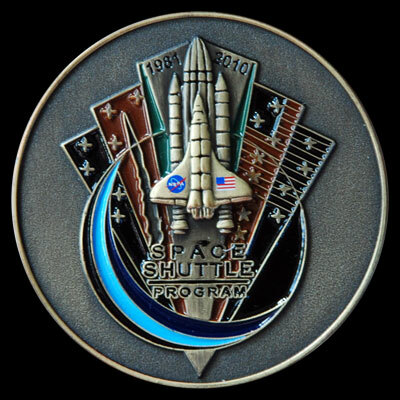 The coin is meant to commemorate the start and end of the program - rushing the production so that ex-shuttle workers can have something with an incorrect date was not a good decision. Just to explore the reasoning behind your objection, do you hold the same position for all the other items that have already appeared (for sale and/or for NASA presentation) with the same design? Are you suggesting that all commemorative emblem items should have been held? And separately: does the date 'error' make this medallion less or more desirable as memorabilia? Randy, 100% agreed. 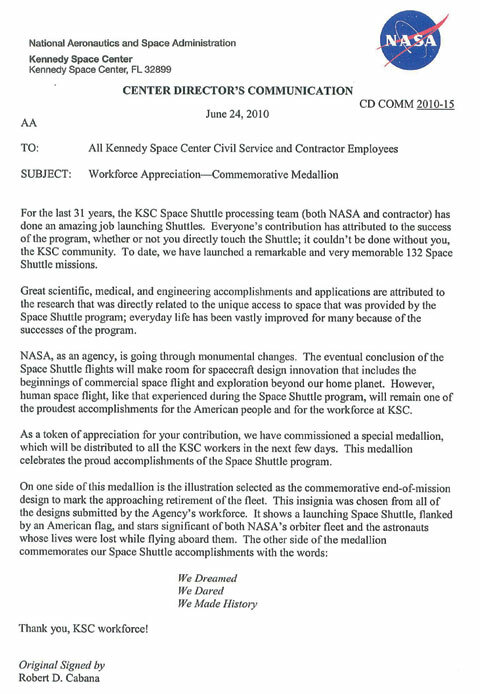 I wonder if NASA's budget does not allow to ship the medallions to their ex-workforce. Another solution would have been to leave the years off the medallion. To answer your question Robert - in my opinion to have an item which is commemorating a historical event that has an incorrect date makes it less valuable as a collectible (that doesn't apply when there's a genuine mistake, such as when a limited number of stamps are printed upside down, have a color shift or lack perforations). In this case thousands (tens of thousands?) of these coins will have the same (incorrect) date. I fully understand the 'difficult' position NASA was in when trying to develop a design to commemorate the end of the Shuttle program, but it would have been best if they actually waited until the last flight was back on Earth until they released items with the 'last' year. In the meantime, if they absolutely, positively HAD to have something before the last mission was back on Earth they could have issued a more generic design without referencing a specific end date. I can't claim to have a detailed suggestion of what that 'generic' design could have been, but there are several artists on this website who, I'm sure, could have developed a great looking design that still achieved NASA's desire to commemorate the start and completion of the shuttle program without dates. Surely NASA will manufacture a MFA medallion made with metal flown on the last flight and distribute it to those who worked on the Space Shuttle program. This medallion looks more like a souvenir. Today NASA officially announced that the final flight in the shuttle program will be in 2011 (the target date is February 26). So now it's official - this coin has an incorrect date on it which is supposed to commemorate the last flight in the shuttle program.